O jornal New York Times foi fundado em setembro de 1851. 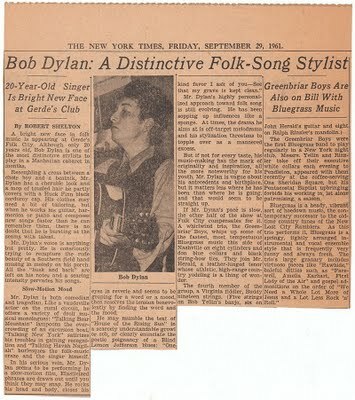 110 anos se passariam até que, no dia 29 de setembro de 1961, Robert Shelton publicasse sua resenha sobre Bob Dylan. Semanas depois, o cantor seria convidado por John Hammond para assinar um contrato com a Columbia, mudando sua carreira e seu tempo. Este seria o primeiro de muitos escritos de Robert Shelton sobre Bob. O jornalista escreveria pelos próximos 20 anos a biografia No Direction Home. Hoje, portanto, faz 50 anos da publicação desta matéria. Resembling a cross between a choir boy and a beatnik, Mr. Dylan has a cherubic look and a mop of tousled hair he partly covers with a Huck Finn black corduroy cap. His clothes may need a bit of tailoring, but when he works his guitar, harmonica or piano and composes new songs faster than he can remember them, there is no doubt that he is bursting at the seams with talent. Mr. Dylan’s voice is anything but pretty. He is consciously trying to recapture the rude beauty of a Southern field hand musing in melody on his porch. All the “husk and bark” are left on his notes and searing intensities pervades his songs. Mr. Dylan is both comedian and tragedian. Like a vaudeville actor on the rural circuit, he offers a variety of droll musical monologues: “Talking Bear Mountain” lampoons the overcrowding of an excursion boat, “Talkin’ New York” satirizes his troubles in gaining recognition and “Talking Havah Nageilah” burlesques the folk-music craze and the singer himself. In his serious vein, Mr. Dylan seems to be performing in a slow-motion film. Elasticized phrases are drawn out until you think they may snap. He rocks his head and body, closes his eyes in reverie and seems to be groping for a word or a mood, then resolves the tension benevolently by finding the word and the mood. But if not for every taste, his music-making has the mask of originality and inspiration, all the more noteworthy for his youth. Mr., Dylan is the more noteworthy for his youth. Mr. Dylan is vague about his antecedents and birthplace, but it matters less where he has been than where he is going, and that would seem to be straight up. so queria agradecer pelos seus artigos no expecting rain. Muito obrigado e um forte abraco da Suica. Bom saber que meus textos são lidos até no Velho Continente!